SAN RAMON, Calif. -- Hurt by falling oil prices, Chevron said Friday that its second-quarter net income plunged 90 percent from the same period a year ago. Shares of Chevron Corp. fell nearly 4 percent in morning trading Friday. Chevron and other energy companies have been hurt by falling oil prices. Several, including Chevron and Exxon Mobil, have announced plans to trim their spending and cut back on drilling. Oil prices have dropped as production continues to increase in the U.S., outweighing demand. Also Friday, Exxon Mobil Corp. said its profit dropped by half in the second quarter on sharply lower oil and gas prices around the world. Chevron said it plans to cut costs to improve its financial results. "Second quarter financial results were weak," said Chevron CEO John Watson in a statement Friday, adding that "multiple efforts to improve future earnings and cash flows are underway." The San Ramon, California, company reported second-quarter earnings of $571 million, or 30 cents per share, compared with $5.67 billion, or $2.98 per share, in the same quarter a year ago. Revenue fell 30 percent to $40.36 billion. 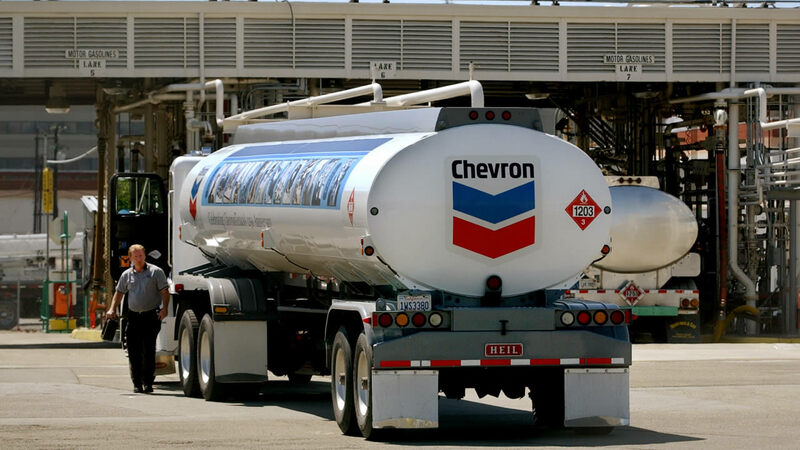 Chevron's shares fell $3.42, or 3.7 percent, to $ 89.61 in midday trading Friday. Its shares are down about 30 percent in the last 12 months.